We live in a wasteful society. After buying products, many people are all too used to throwing them away, and haven’t quite grasped the concept of recycling yet. But we are getting there slowly. To work towards a greener future we must look at specific ways to be more economical, which will allow us to stop pumping so much hazardous gas into the atmosphere. It probably isn’t the first thing that springs to mind, but one way we can significantly reduce our carbon waste output is through making a worldwide effort to recycle ink cartridges. Chuck a printer cartridge into a landfill heap and it will take 450 years to decompose. Ink cartridges have a huge negative impact on our environment; here is a breakdown of why this is so. It is evident that some of us, ranging from the little guy to huge corporations, make the effort to recycle ink cartridges. Every year 2.5 million ink cartridges are sent off to recycling plants and become re-used – however a staggering 10 million end up in a landfill site. According to a Planet Ark report in 2006, if 18 million ink cartridges were sent to the dump this would create waste of 3,000 tonnes of plastic, 2,500 ferrous metals, 400 tonnes of aluminium & 26 kilograms (about 58 pounds) of precious metals. On top of all this, that 3,000 tonnes of plastic can take up to well over a couple of hundred years to degenerate. Have you ever thought what makes up your printer cartridge? The packaging comes from timber, the plastic is from the world’s supply of crude oil, and steel is from iron ore etc. This is a big waste of fossil fuels and raw materials. Since plastics have been around for a relatively small time in the grand scheme of things, people are beginning to worry with the amount of plastics contained in landfill sites – space is becoming an issue. 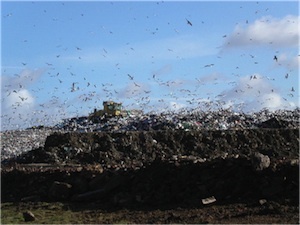 When all this waste is dumped, it doesn’t sit there – it is interacted with, and also interacts. Not only does wildlife mistake plastics for food, but it can destroy their natural habitats also. Water can also become contaminated by the ink cartridges and also poison the soil, effectively destroying the ecosystem for generations. With materials from printer cartridges not being biodegradable, the surrounding ecosystem, both flora and fauna, will not have a future. If we don’t act quickly, we will be punishing future generations of children for years to come. It may not seem at the moment like the world has a massive problem, but if in 450 years’ time and we carry on the way we currently are… there is little hope for us. Animals with become extinct, ground will become unusable , water will become contaminated and space will run out – it’s slightly reminiscent of a dark, dank dystopic world we see in films all the time. There are plenty of different recycling plants around the world to get involved in which actually offer reward points as incentive for recycling… a win for you and a win for nature! It is important to find ways to keep the environment safe along with the evolving technology. Printing can leave a lot of eco-waste if the task will not be practiced correctly. It would be best to find alternative printing supplies that can still ensure high-quality print output minus the carbon footprint. We have been in the ink game for 10 years and believe that refilling Ink Cartridges is not only the cheapest way to go but is also the best way to go as far as the environment is concerned. Still, using refills stills supports a lot of plastic waste doesn’t it. It reduces how much metals go to landfill, but still doesn’t solve or help the problem a whole lot. Is it better if the refilling process was conducted in stores, ie, you take the cartridge in for it to be refilled? I mean, you still have to go out and buy the refill’s or new cartridges anyway, why not go in and have them refilled. This would cut some packaging and extra costs and unnecessary waste wouldn’t it? According to Ricoh, only 15% percent of toners and inks are actually recycled in the UK. This seems a scandalous amount, especially when considering the costs (both financially and environmentally). I see to many fly by night operators in the industry. Those are the guys that really hurt the industry as they don’t know anything about safe disposal. In the end the cartridge that can’t be used ands up on the landfill. Many of these cartridges are sent to China where they end up on huge landfill sites, which are scavenged by children who then inhale the carcinogenic toner while they dissect the cartridges to find any metals/components that may be valuable. snickerkid, I agree, recycle ink cartridge is better for the world. Less plastic waste for all. I have been in the printer industry for 18 years now and have been a printer cartridge manufacturer and supplier for 7 years. I feel that it is important to not just recycle the printer cartridges, but also make sure as a printer cartridge supplier to safely dispose of cartridges that can’t be used again. Every year we find about 13% cartridges that can’t be used again and those should be disposed of safely. It is important that generic cartridge remanufacturers comply to ISO 9001 which is all about product quality and ISO 14001 standards which is standards to protect the enviroment. I see to many fly by night operators in the industry. Those are the guys that really hurt the industry as they don’t know anything about safe disposal. In the end the cartridge that can’t be used ands up on the landfill. Everything we can do reduce waste and the help the environment should be seriously considered. Think before you print and recycle your cartridge when possible.